After a number of frustrating delays, Nvidia’s first G-Sync, high refresh rate, HDR monitors are almost upon us. The first of these, The Predator X27, is already up for preorder. We always knew that it would put a big hole in a buyer’s wallet, and now we know by how much. Newegg lists the gamer’s dream display for $1999 and they're ready for delivery on June 1. After being shown off at CES last year, the monitors from Nvidia partners Acer and Asus were supposed to arrive sometime in 2017 but were pushed back. We got confirmation from Nvidia earlier in the week that the displays would launch this month, though the prices still hadn’t been confirmed. Preorders for both the Predator X27 and the Asus ROG Swift PG27UQ went live on several European retailers last month, with their US price equivalents ranging from $2500 to $3000. The $2000 Newegg price is lower than many expected, even though that amount could get you a pretty powerful PC. Newegg has limited the number of monitors to one per customer, but it seems the price tag hasn’t put people off—they’re already out of stock. 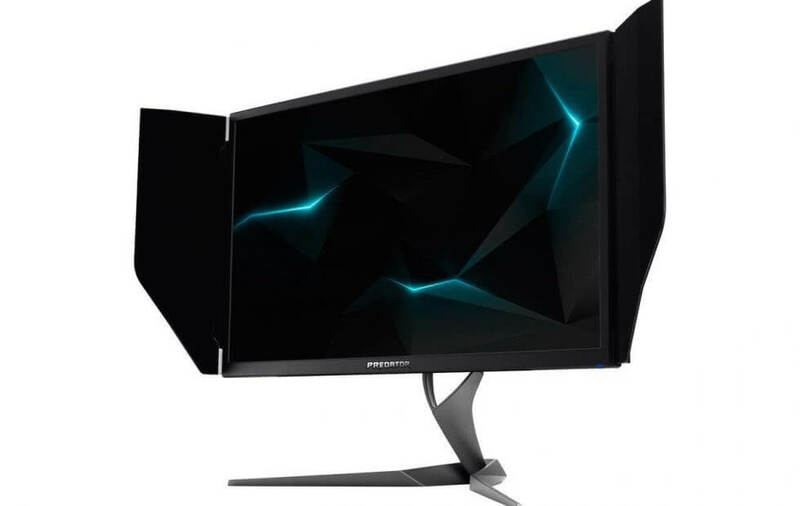 High demand isn’t that surprising, given the Predator X27’s specs: an AHVA panel with a 3840 × 2160 resolution, 178°/178° horizontal/vertical viewing angles, 4 ms GTG response time, 600 nits native brightness that reaches 1000 nits, 144Hz max refresh rate, 384-zone backlights, 99 percent coverage of the Adobe RGB spectrum, full 10-bit HDR support, and, of course, G-Sync. In addition to all those display features, the monitor has enough connectivity options to keep gamers happy, including HDMI 2.0, DisplayPort 1.4, and four USB 3.0 ports. As most people know, the only real issue with these monitors is that even a GTX 1080 Ti isn’t enough for 4K@144Hz. Let’s hope Nvidia's upcoming GTX 1180 (or whatever its called) is more suited to the task. For those who would settle for a 4K 120Hz monitor without any adaptive sync technology and a lower brightness level (400 nits), Wasabi Mango’s 43-inch UHD430 went on sale last week priced at $1400. And if you really want it all, Nvidia’s 65-inch Big Format Gaming Displays are scheduled to arrive before the year is out—but expect them to cost a small fortune.